Reginald Bacon was not wearing a seatbelt when his forklift truck tipped over at work. 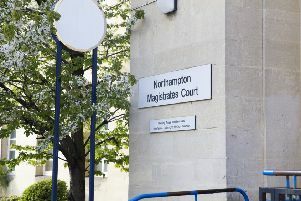 A Northamptonshire man who was crushed by his forklift truck at work could have escaped a fatal injury if he had been wearing his seatbelt, an inquest heard. Reginald Bacon, 53, from Winston Close, Daventry, died at the scene in October 2016 after his forklift tipped over at a late-night incident at Fortec Distribution, in Watford, Northamptonshire. The court heard how the tragic death happened at a pallet-loading warehouse, which one witness described as "organised chaos" and "an accident waiting to happen". A queuing lorry driver, employed by NLC, had tried to straighten up because the trailer of his HGV was sticking out of the waiting area, marked out by yellow lines. But the crooked trailer meant the driver could not see in his mirrors that Mr Bacon had already driven up to his lorry - at the side and towards the back - with his forklift truck and was trying to lift a pallet out. When the lorry moved forward, Mr Bacon's forklift tipped over sideways. Coroner Jacqueline Devonish said: "There was no way [the HGV driver] could have seen Mr Bacon in his mirrors. "[When the forklift fell over], another HGV driver saw Mr Bacon try to jump from the forklift. It fell on top of him." A paramedic arrived at the scene within minutes, but Mr Bacon had already died from a severe head injury. The inquest heard that Fortec's company policy for forklift truck drivers was to always wear a seatbelt and stay in the vehicle if it falls over. But evidence heard at the inquest suggested Mr Bacon may not have been wearing a seatbelt. Mrs Devonish said: "If Reginald had a seatbelt on, he would not have been able to get out the forklift truck in time. And she added: "Had he been wearing his seatbelt, he would not have suffered a fatal injury." In a statement read out by the coroner, Mr Bacon's eldest daughter Leanne Evans said: "He was a happy, jovial and very opinionated man. He enjoyed woodwork and was a big fan of Coventry City." A jury returned a verdict of misadventure.